"The God of the forest is very angry and some night he will come through the pass and destroy us all." THUNDEROUS, vibrating with a sinister quality, and ending in a blast that bespoke anger, the far-off trumpeting of a hairy mammoth echoed through the gathering twilight and caused the members of the Flat Head tribe to look at each other in alarm. Some of the more timid of them even withdrew from the circle gathered about the council fire and hurried up the steep paths that led toward the dwelling caves in the cliffs, for even the voice of the Mountain-That-Walks struck terror to their hearts, though the great beast was far off. But to one in the council ring that trumpeting seemed to bring an evil joy. He was the ugliest, scrawniest, meanest looking man in the group  Pong, the Devil Doctor. He nodded with wicked satisfaction as his little eyes glowed with an unpleasant fire, and he exposed yellow and broken stumps of teeth as be smiled at Big Tooth, the leader of the Hairy People, and his three friends, Og and Ru and Tao, of the Cave People. "Hi-yah," he exclaimed. "You hear that, Big Tooth. It is as I say, the God of the Forest is very angry because the Flat Head People have stolen his sweet cane. Every night he draws nearer the valley of the Flat Heads and some night he will come through the pass and destroy us all, unless you buy and hang up on a tree my charm to keep him out. I have spoken." 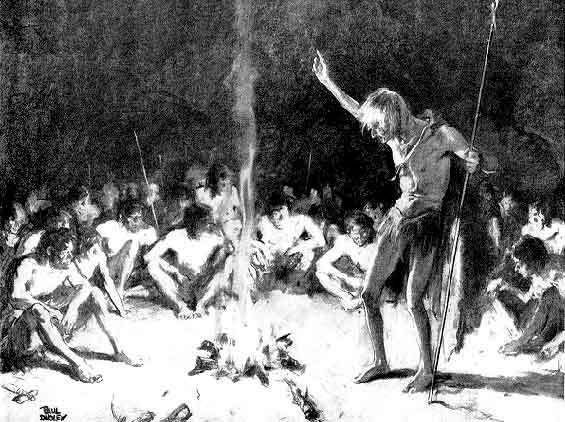 There was a restless murmur among the Flat Head men who were gathered in an inner circle about the fire, and a strange hissing sound of fear as the women and children grouped behind them turned their eyes from Pong to Big Tooth, their young leader. For a long time now, Pong had been haranguing the council on the need for a charm to keep the great beast, whose voice frightened them, out of the valley. But Big Tooth shook his head stubbornly. "That is not the voice of the God of the Forest. It is the trumpeting of Mala the Mammoth  the Mountain-That-Walks," said Big Tooth. But even though he spoke stoutly, still he rolled his eyes toward the quarter whence the sound came and there was fear and uncertainty in his expression. "Aye, it is Mala, the Mountain-That-Walks. But he is cramat. He is holy. The God of the Forest has clad himself in a mammoth skin, and he is looking for the Flat Head People who listened to the evil of Og and Ru and Tao, and stole his sweet cane to plant it here in our valley. Some night he will find the way into the valley and destroy these patches you call a garden and he will destroy the people for defying him and stealing his cane. Only my charm can keep him out of this valley. I say it." The Devil Doctor raised his ugly head and wrinkled countenance and peered about the council, his eyes glowing balefully, while the people stirred restlessly, and, looking at each other, murmured among themselves. But their murmurs were hushed when Og, the leader of the three young Cave men who had come to live among the Flat Heads and help them, rose and spoke. "Pong talks evil. He seeks to put great fear into the hearts of the Flat Head People. This voice that frightens you is not the voice of the God of the Forest. It is the trumpeting of a mammoth who is not cramat. He is not holy. There is no such thing as a holy mammoth. And if this one comes into the valley of the Flat Head People we will kill him as the Cave People have killed these beasts before. But Pong only smiled unpleasantly. "This is big talk and sounds well while Mala the Mammoth is over behind the mountains," he said contemptuously, "but when he gets into this valley our friends from the Cave People will run with the rest and scream in fear, for what can weak people do against a god in the skin of a mammoth. I have seen these creatures pull trees up by the roots and trample men and women under their great feet like bugs. And this one will be more savage than any, for he is a god who is angry because the people have stolen his sweet cane." "HE IS not a god," replied Big Tooth quickly, rising. "We believe Og who tells us he is but a creature. And if Flat Head men have fled in fear before a mammoth it was only when they were weak and cowardly, and lived in trees. Now the people live in caves. They are brave. They have weapons. They have fire which Og and his friends have taught them how to use. They have spears, too, and strong bows and arrows which Og and Ru and Tao have made for them. They are not afraid of the Mountain-That-Walks. They will kill him, as Og tells us the Cave People kill such beasts." Big Tooth was trying to instil courage into the Flat Head People and his bold statement made some backs stiffen and some eyes glisten with inspired courage. Pong was quick to detect this and he spoke up with withering sarcasm. "More brave talk," he said. "But if the Flat Heads are so courageous why do some of them slink away to their caves when the voice of Mala the Mammoth sounds from behind the mountain? Why do others tremble in fear? Look about the council circle. See how brave they are. When the Mountain-That-Walks comes into this valley, and he will come for he is looking for his stolen sweet cane, then these brave Flat Heads will run screaming away in fear or fall down on their faces and cry out for mercy. But the Mala the Mammoth will have no mercy. He will trample them all to death in his anger. "I tell you all," he went on louder, "that there is only one way to keep the Mountain-That-Walks out of our valley. It is by magic  my magic. I will make a charm and put it on a tree in the pass that leads into this valley. It will be such a strong charm that the Mountain-That-Walks can not pass it. It will protect the people and they should be willing to pay me for it with mussels from the river and fruit and berries from the forest, and sweet cane from their gardens. I will"
"Stop!" exclaimed Big Tooth suddenly. "You have said enough. You seek to frighten the people into paying you for your magic. Always you find ways to scare them into giving you the best food. This shall not be. Life is too hard for the people to have to give half their food to one who does not work for it. They will not pay you. I forbid it. I do not believe in your magic and your charms. Neither do many others. Always you told us of the monsters that peopled the misty valley below the volcano and the gods who dwelled in the fire mountain and boasted how your magic protected the people. But our good friends Og and Ru and Tao went into the Valley of the Mist, they found no monsters there, which proved that you lied to the people. You are lying now, when you say you will make a charm to keep the Mountain-That-Walks out of the valley. If he tries to come in, no charm that you make can keep him out. You are a fraud, Pong. I say it." "Have a care, Big Tooth," snarled Pong, his face working with hate. "Have a care. I will put a curse on you. My magic is strong." "But I have stronger magic here, in my right hand," said Big Tooth, suddenly grabbing up his stone axe which lay at his feet, "and I will use it to split your skull open unless you leave this council circle." Pong, in alarm, backed hastily out of Big Tooth's reach for well he knew that one blow from that axe, in the hands of the burly young leader, would cleave his skull as easily as a bird's egg could be crushed between his thumb and forefinger. Safely out o� reach, however, he stopped and drawing his robe about his scrawny shoulders, stood erect and very dignified while he glowered at Big Tooth and his three companions. Then suddenly he made a strange sign in the air with one claw-like hand, and hissed like a serpent. Then he spat, and even as he did so, from far off, through the gathering twilight, came the trumpeting of the hairy mammoth again much louder and much more prolonged. "Hah-h-h-h! You hear that, Big Tooth. My curse is on you and the people. You will regret this when the Mountain-That-Walks comes into your valley. And he will come to find his sweet cane, never fear. In my dreams a spirit told me of his coming." Then, turning, he padded up the steep path toward his cave, while the trumpeting bellow sounded again and again through the night and caused the Flat Heads to gather about the fire to look fearfully at each other, then suddenly scramble to their feet and go hurrying up the cliffs to their caves, fear overcoming their efforts to appear courageous. And as darkness closed down over the valley only Og and Ru and Tao, and Big Tooth, the leader of the Flat Heads, remained beside the council fire, their foreheads furrowed in annoyance at the timidity of the people. IT WAS an idea. advanced by Tao that was responsible for all the trouble in the Flat Head village. He and Og and Ru, along with Big Tooth, the Flat Head leader, on an expedition into the jungle beyond the valley into which the Flat Heads had migrated, had found a great glade of sweet cane, which the Flat Heads were very fond of. It was a new food to the young men from the Cave colony far to the north, and they found that they liked it too, and they brought a quantity of it. back to the Flat Head village with them. Immediately other Flat Head People began to make treks into the jungle to this cane glade and soon they were bringing back great bundles of the sweet stuff, which they chewed or from which they gathered a sweet, sticky sap by crushing it between two stones. But it happened that a huge hairy mammoth from the north had wandered down into this section of the jungle and had found the cane field, too. There he spent days browsing on the sweet food and tramping down much more than be ate. It was inevitable that the Flat Heads should come in contact with the great beast sooner or later and they did eventually to their sorrow. Several of the cane gatherers were killed and others injured when the big beast charged them, and so fearful were they of the Mountain-That-Walks that they dared not venture to the cane glades again. This annoyed Og and Ru and Big Tooth, who were built of sterner stuff. They did not like to see the people made cowards of by beasts of the jungle, not even such a formidable beast as the Mountain-That-Walks. Og and Ru were for going out into the jungle and trying to waylay the creature and kill it, as Og had once done by dropping from a tree onto the head of one and crushing in his skull with his stone axe, and as Ak, Tao's father, had done when he found one mired and helpless in a great bog and slew it with a long spear. Big Tooth was willing to try, but he knew the dangers of hunting a mammoth. The chances were that one or more of them would be killed. Tao the Thinker knew this also and he tried to devise other ways of getting the sweet cane for the people. After days of thinking he developed an idea. The Cave People had experimented a little with growing things. Og had made salt beans grow and Tao's father, Ak, had brought back from a long journey millet which he had planted and caused to grow for the Cave People. If they had been able to do this, then Tao felt sure he could get seeds of the sweet cane and plant them along the river that ran through the valley of the Flat Heads, thus growing a new supply of sweet cane for Big Tooth's people that would be handier to them and would not necessitate dangerous journeys into the jungle. Og and Ru and Big Tooth thought well of the plan when Tao told it to them and they made a journey to the cane glade and got some seeds and young growing plants. These they brought back to the valley and Tao planted them in the soft moist earth beside the river, with startling results. The soil was so rich and the sun was so strong that these first experiments in agriculture were a decided success and it was not long before the Flat Heads had cane growing in the valley in abundance. These ventures in primitive gardening did not suit Pong, however. For one thing, they robbed him of the chance of collecting pay for charms he might have made to protect the jungle cane glade, and for another, they gave the Flat Heads new knowledge and greater ability to care for themselves and not depend upon his magic to produce good and fend off evil. He talked loud and long against Og and Ru and Tao for daring to try to make cane grow where the God of the Forest had not planted it, and he insisted that the three Cave men would bring evil down upon the Flat Head tribe if they persisted in these efforts. But Big Tooth and his people paid no great heed to Pong at first. They were happy owning their own cane fields. There came a time, however, when the cane glade in the jungle became exhausted with the inroads the big mammoth and the Flat Heads had made on it, and soon the great creature of the north found that there was no sweet food left for him. Nightly his trumpeting of disappointment and anger echoed across the jungle to be heard in the valley of the Flat Heads. Pong began to talk again, then. With evil satisfaction he told the people that the God of the Forest was indeed angry with the Flat Heads for allowing Tao and his companions to rob the cane glade and transplant it in their valley. He said the god had clothed himself in the skin of this hairy mammoth and that the great creature was wandering through the jungle looking for a way into the valley to destroy the Flat Heads. All this talk caused a great fear among Big Tooth's people and when Pang proposed that he be hired to make a charm to keep the mammoth out of the valley the people asked Big Tooth to call a council. Big Tooth was impatient with the people for listening to Pong. So were Og and Ru and Tao, too. They forgot that the Flat Heads had made fast progress since the coming of the three young Cave men to Big Tooth's village. They forgot that from living in trees, the Flat Heads had moved into the caves of the new valley that they and Big Tooth had found. They forgot that they had adopted fire and weapons, and had reached a state of civilization equal almost to that of Og's own Cave People through the teaching of Og, Ru and Tao. They forgot that instead of just subsisting on fruit they now hunted and dug for mussels in the river that ran through their new valley, and they had adopted skin clothing and even rude moccasins that Tao had fashioned. All they could see was that the people were still listening to Pong and were awed by his talk of magic, and cowed by his stories of monsters, and good and evil spirits and all the other superstitions that he strove to impress them with, and they were all discouraged when the far-off trumpeting of the mammoth drove the people cowering to their caves that night after the council and left the four of them there to reflect on the problem that confronted them. "Mala the Mammoth is nightly drawing closer to our valley," admitted Big Tooth as he listened to the far-off trumpeting. Og and Ru were listening also. Presently Og nodded, and spoke. "Yes. He has eaten up all the cane in the jungle. He now smells our cane in the valley. He is looking for a way to get in without climbing the mountain, for his big, flat feet are not good for hills." "Some night he will find the pass, and come in to eat up our cane. Then Pong will be happy for he has foretold his coming. The people will believe in him then more than ever and pay him good food for his charms and his magic," said Ru disgustedly. "I wish there was such a charm that would keep him out of our valley," said Big Tooth, his brow puckered in worry. All three were silent then for some time, until Tao, his eyes brightening, spoke suddenly. "Hark, you, Big Tooth. I have a plan. It is not a charm, but it will keep Mala out of the valley. There is only one pass in from the north. It is narrow. We will dig a great hole, so, in the narrowest place." Tao drew some marks on the ground as was his habit to illustrate what he said. "It will be so deep that Mala, falling into it, cannot get out, for, as Og said, he is a poor climber. If he comes into the pass he will not see the hole, because it will be covered with branches, but when he steps on these branches they will break under him, and he will be in a trap. Then Og and Ru and you, Big Tooth, can slay him with your arrows." For a moment Og and Ru and Big Tooth looked at Tao's drawings in the dirt, then they looked at each other. Finally Og smiled and nodded. "This is good. Tao has thought wisely. This is the kind of a charm that will keep Mala out of the valley. With the sunrise, call all the Flat Heads together and we will dig a great hole, Big Tooth." "This is better medicine than any charm that Pong might hang on a tree. Tao is a great thinker," said Big Tooth happily, at which Tao smiled with satisfaction, for while he did not know that he had conceived the first pitfall, he did know that it had taken some hard thinking to piece the plan together in his mind. "They have made little of my magic. They will see this time that it is strong medicine. I have put a curse on them and on the people. The Mountain-That-Walks shall come into the valley. I will bring him here. And when he has crushed down their cane gardens and killed a few of the people they will think more of my charms and be willing to pay me for them. I have spoken." He gathered his skin robe about his narrow shoulders then and as softly as a snow leopard made his way down the path to the council grounds. There he paused a moment while he listened to the soft night sounds, and wailed for the far-off trumpeting of Mala the Mammoth. But the trumpeting did not come and he seemed disappointed. "The Mountain-That-Walks has gone deep into the jungle. But he is hungry for sweet cane, and a trail of the bruised stalks dragged through the forest will show him the way to the pass and bring him into the valley." He nodded his ugly head on his scrawny neck as he turned down toward the river, there to pause at the nearest cane garden to break down a armful of stalks, and bruise the ends of them between stones so that the sweetly pungent sap would ooze out. Then binding these together be made a drag of them, which he trailed behind him on the ground as he moved across the valley toward the pass and through it out into the jungle. There he made several broad trails all of which were sweetly scented of cane sap, and led directly toward the pass into the valley of the Flat Heads. And so intent was he with his treachery that he worked until long after sunrise, before he started back for the valley again, only to discover that he could not get through the pass himself without being discovered, for, from a hiding place on the edge of the jungle he could see that all of the Flat Head People under the leadership of Big Tooth and the three young men from the Cave People were engaged in some strange activity at the pass, all of which he could not comprehend. He did not know that the Flat Heads were digging a great pitfall in which to trap Mala the Mammoth. But he did know that he could not get back through the pass without being seen, thus causing the people to wonder why he had been abroad so early in the morning. So he crouched in his hiding place behind the bole of a great tree fern and watched and waited. WHILE dawn was breaking, Big Tooth awakened the village of the Flat Heads and held another short council, explaining the plan that had been thought out by Tao. And with the coming of daylight the Flat Head People seemed to gain more courage, for they reacted to it with enthusiasm and when Big Tooth explained that they must all go to the pass and dig a great deep pit they gathered together their weapons and started in that direction in a mass. Digging was a new art to these people who had so long lived in trees, but Og and Ru and Tao showed them how the Cave People dug, loosening the hard earth with their stone axes and scooping it out in double handfulls. And when they saw what was required of them, and comprehended Tao's plan fully, they fell to the work with enthusiasm, and in an amazingly short time a great hole was being scooped in the earth between the sides of the two mountains that formed the gateway into their valley. While they worked Og and Ru and Tao broke down and gathered fronds of the big tree ferns that grew in the pass and by the time the pit was dug so deep that the Flat Heads themselves had difficulty climbing out, the three young men from the Cave People were ready to cover it over. This they did under Tao's direction, for he had definite ideas as to how the great hole should be hidden. When the work was finished there was great joy among the Flat Heads, for they felt confident now that this pit would protect their valley from the invasion of the Mountain-That-Walks. Indeed, the digging of that pit and the artful way in which Tao hid it from sight impressed the Flat Head People with the idea that they had accomplished a great thing, which they bad, and they began to chatter among themselves, and nod and smile to each other, and thump themselves on their chests with pride. But their rejoicing was short-lived, for even while they were telling each other that they were brave people and did not fear Mala the Mammoth, from the depths of the jungle burst forth the thunderous trumpeting of the Mountain-That-Walks, and the people all became suddenly silent and grave of face. They did not know that Mala the Mammoth had come across one of Pong's drag trails of bruised sweet cane, and that he was following it through the forest directly toward the pass. They did know, however, that the mammoth was heading in their direction, and with each trumpeting bellow, he was coming much nearer. They looked with a certain amount of alarm in the direction of Og and Ru and Tao, and Big Tooth, their leader, and some of them grew so fearful that it would have taken very little to have started them scurrying down the valley toward the caves in the cliffs. Big Tooth and Og saw this and realized that they must instil courage in them. At the suggestion of Og, the Flat Head leader leaped to the top of a boulder and began to talk to the people. "Mala the Mammoth has found the way to get into our valley. He is coming this way to eat our sweet cane and tramp down our little gardens. But we are ready to protect ourselves against him. The pit will stop him and our spears and arrows will slay him. String your bows with your stoutest arrows and hide behind these trees and boulders. Og and Ru, who pull mightier bows than any of us, will be out in front. They will crouch behind yonder boulders on the edge of the pit, and Tao and I will be with them. The Mountain-That-Walks will not get into our valley. I have spoken." And his bravery of spirit so impressed the Flat Heads that none of them broke and ran for their caves. 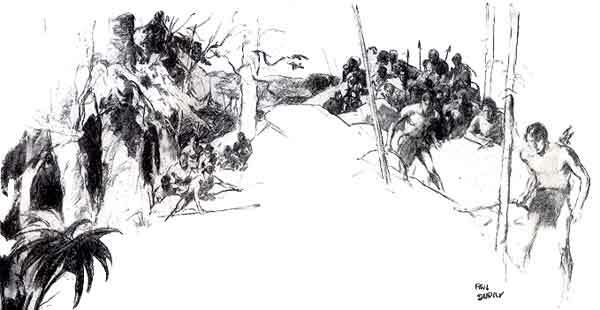 Instead the women and children fell back into the forest at the entrance to the pass, while the men strung their bows and found secure hiding places where they waited with arrows ready. As for Big Tooth and Og and Ru, they, with Tao, who possessed no bow but clutched his stone axe in a brave grip, moved forward close to the edge of the great hidden pit, where they crouched down behind two boulders and waited. Mala the Mammoth was assuredly coming toward the pass into the valley, and coming fast. His trumpeting bellows sounded nearer and nearer and presently, from afar, Og and his companions beard the threshing and crashing of his huge bulk as he plunged headlong through the jungle. The Mountain-That-Walks feared nothing in the prehistoric wilderness and he cared not who heard him move through the forest. Man and beast alike got out of his way, or if they did not, they were run down and trampled under foot, or seized and hurled tremendous distances by his short powerful trunk, for his temper was testy and he brooked no interference from anything or anybody. 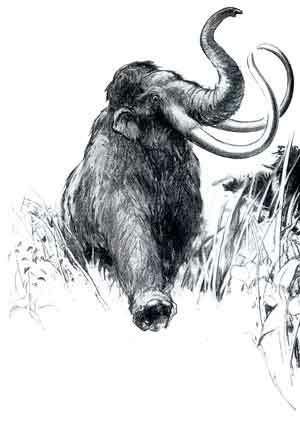 THIS mammoth was as mean-tempered as the rest, and particularly resentful toward the puny creature called man, who inhabited the wilderness. He had had several experiences with Flat Heads, and hated them, for he knew that they were robbing the jungle cane glade and taking food that he believed belonged to him. 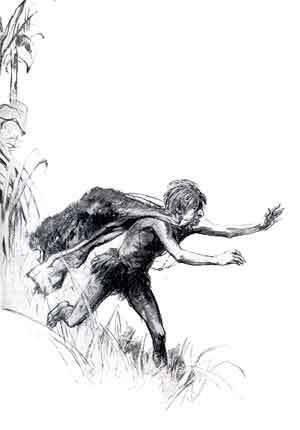 He had caught their scent in the glade every time he had come there, and on different occasions he had seen and charged some of the fear-ridden two-legged creatures. He had killed several of them and had developed an undying hate for them. Indeed their odor always sent him into a savage rage. It was the scent of human beings that interrupted his lumbering progress through the jungle as he followed the strong odor of sweet cane directly toward the pass that led into the' valley of the Flat Heads. He had picked up the drag track that Pong had left, but as he followed it he detected about it a human odor, and as he approached the pass, wafted to him on the wind the human odor became much stronger. Indeed it caused him to come to an abrupt stop some distance away from the pass and test the air with his upraised trunk, while his tiny eyes glowed with a savage fire. A strange, crafty attitude came over him then, and from a headlong, lumbering charge, his progress changed completely. Instead of plunging forward regardlessly, he suddenly became almost as quiet as a shadow, despite his great bulk, as he made his way through the thick growth, for into his keen little brain came the idea that somewhere close at hand a lot of these puny humans were congregated; perhaps in the very cane glade to which he was going. It would give him savage joy to catch them in there and trample a few of them to death before he ate his fill of sweet cane. But as he gently stole forward, moving almost as softly as a shadow, he became more and more puzzled. The wind brought him the odor of human beings from a distance. But he could also smell a human being close at hand. He did not know that he had blundered within a very short distance of the hiding place of Pong, the devil doctor, but a strange instinct told him that there was one of these hated human creatures somewhere within a very short distance of him, though his tiny eyes, which were not so keen, could not locate him. He began to thrash around in the jungle looking for the Devil Doctor, forgetting the sweet cane for the moment. But Pong, hearing the creature coming, had climbed up into a tree fern and cowered there behind some of the broad fronds and Mala could not find him. This made the mammoth savagely angry. He threshed harder, his short trunk and great curved ivory tusks swishing through the undergrowth and tearing it up in great clumps as he tried to find Pong. Quite by accident the mammoth blundered against the giant tree fern in which Pong had taken refuge. This frightened the Devil Doctor, and with a cry of alarm he scrambled higher among the great fronds. Mala saw him then, and with a trumpeting blast tried to catch him with his curling trunk. But Pong was beyond his reach and savagely Mala seized hold of the tree fern and shook it violently. It was as if a cyclone struck that single tree. It swayed and bent until the trunk all but snapped and Pong, though he tried manfully to cling fast, was literally hurled out of it to fall thirty feet away from the mammoth. But he landed in a clump of undergrowth and was unhurt and, even as Mala charged toward him uttering his strident blasts, Pong leaped to his feet and started to run as fast as his scrawny legs would carry him. Before the Mountain-That-Walks could get his great bulk under way, Pong plunged for the edge of the jungle heading toward the path that led through the pass, into the valley of the Flat Heads, and a moment later Big Tooth with the waiting Og and Ru and the rest of the Flat Head People were amazed to see their Devil Doctor burst out of the forest with the lumbering Mala not far behind him. "Beware, Pong! Beware! Do not run across those ferns! There is a trap set for Mala! Leap into the nearest tree! Seize that branch and pull yourself upward!" Only just in time did he shout for Pong was almost on the edge of the trap. But the Devil Doctor, keen of brain, and agile as all these former tree dwellers were, understood. A branch was hanging low in his path and with a leap he hurled himself upward and grasping it tried frantically to haul himself out of the mammoth's reach, while Mala, with a trumpet of triumph lumbered forward eagerly, heavy head raised, glistening tusks tilted upward and short trunk curling snakily, and never seeing nor even suspecting the trap that had been set for him. And he almost reached the Devil Doctor, too. Indeed the end of that trunk actually brushed one of Pong's naked, kicking legs as he hauled himself upward into the tree, when suddenly the mammoth's heavy, ground-shaking feet, struck the soft earth at the edge of the covered pit and it gave way under him. Frantically the beast tried to check his headlong plunge, but it was too late. His great bulk hurtled forward and plunged downward, and the next moment he was floundering in the pit trumpeting his terrible anger while Og and Ru and all the Flat Head People loosed arrow after arrow at him, and yelled their triumph. The mammoth's struggles were desperate and his wrath was unholy. His bellowing awoke the echoes of the jungle and his great weight seemed to shake the solid earth as he struggled to climb out of the pit. But it had been dug deep, and before he could climb out, his big body was fairly bristling with arrows while Flat Head men hovering on the edge of the pit plunged their spears deep. into his hairy carcass until they pierced his vitals and he lay still. Then began a wild dance of triumph about the great hole which was the forerunner of the celebration and a feast to follow, for the Flat Heads had indeed achieved a great victory. They had killed their first mammoth, and they had protected their valley and their gardens of sweet cane from the inroads of the Mountain-That-Walks, and they were very happy. And during the excitement of the occasion Pong, the Devil Doctor, climbed down from the tree in which he had taken refuge, and slunk away to his cave in the cliffs, muttering threats against Og, Ru, and Tao, whom he knew were responsible for this triumph.